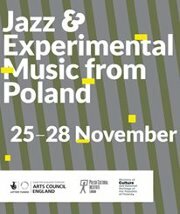 At the end of this month, Polish and British musicians are getting together in London for four nights of jazz and experimental music. If last year’s programme is anything to go by, audiences at The Forge (25.11), Vortex Jazz Club (26.11), Queen of Hoxton (27.11) and The Hackney Cut (28.11) are in for something special. The experimental music scene in Poland – across a whole range of genres and disciplines – has never been more vibrant. Among those appearing are the Postaremczak/Kusiołek Duo (sax/accordion), three solo jazz musicians – Hubert Zemler (percussion), Rafał Mazur (acoustic bass guitar) and Marcin Masecki (piano), who made such an impression last year – the Warsaw-based band ParisTetris and the Levity trio. Also taking part are UK musicians including Vocal Constructivists (who will be singing works by my own composition teacher, the iconoclastic Bogusław Schaeffer), Cornish-born Jim Hart (vibes) and Patrick Farmer, who’s creating a programme of installations and performances based on the ‘absent’ sounds of the city, in collaboration with Krzysztof Topolski and Kacper Ziemianin (who also appeared last year). You can access all the necessary details @ http://www.experimentalpl.co.uk. This highly informative site – complete with artist bios, videos and audio files – also includes details of last year’s programme: http://jazz.deconstructionproject.co.uk.